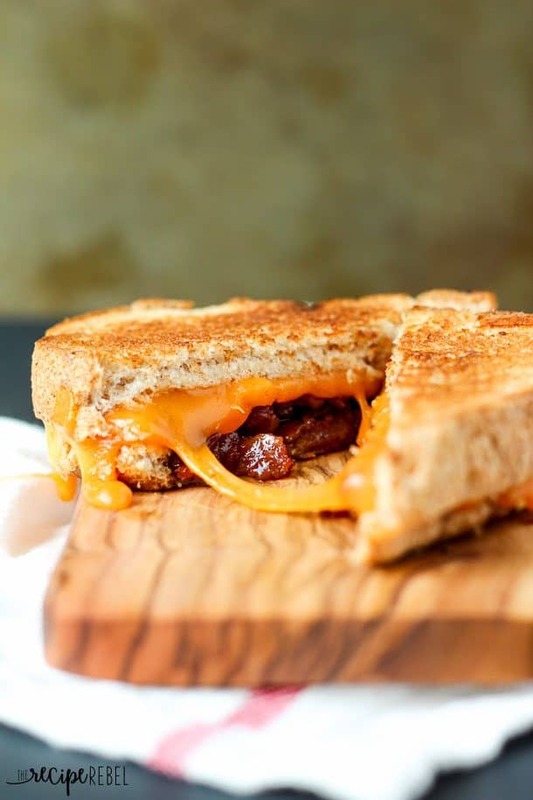 Toasty bread, melty cheese and sweet and smoky maple bacon jam make this the best grilled cheese you’ll ever have! Words cannot express the mind-blowing flavour of this sandwich. But for you, I’ll give it my best shot. I discovered that bacon jam was a real thing on Pinterest quite some time ago. I tucked it safely away on my Condiments board for a day when I would actually have time to spend making something as frivolous and unnecessary as bacon jam. Alas, Spring Break 2014 arrived. I was wrong, though, about bacon jam being frivolous and unnecessary. And it’s jam. Made of bacon. Bacon. Apple juice. Maple Syrup. Brown sugar. Onions. Garlic. Balsamic Vinegar. This was one of those times when I made a single batch, and kicked myself afterwards, wondering how I was possibly going to live when this jar was done and I had to wait until I had time to make another. I probably won’t have to wait too long, though. Because it takes a mere 45 minutes. Maybe that sounds like a long time to you. But that’s only because you haven’t made this jam. Made of bacon. The bacon jam is a big enough deal to have its very own post up here on The Recipe Rebel, but I was trying to think of things I would put this jam on. Besides a spoon. Or a ladle. Or a shovel. 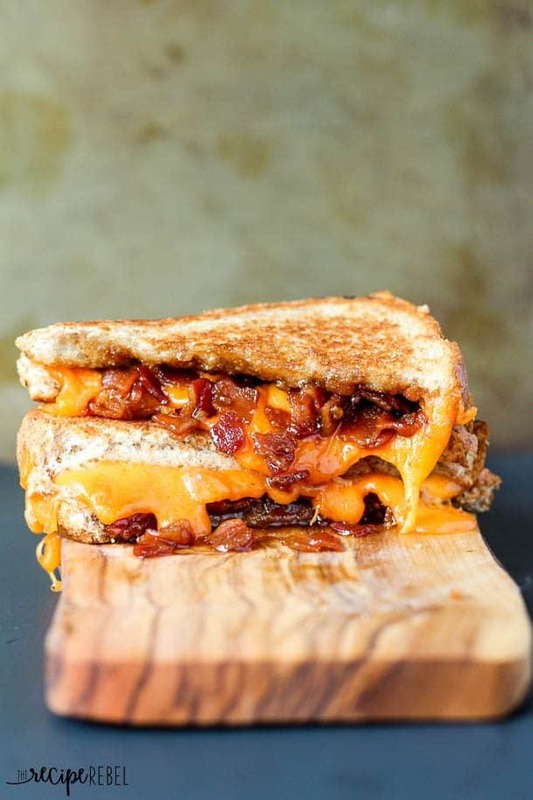 And I thought to myself, “I bet a bacon jam grilled cheese would be just about the best grilled cheese that was ever made”. And, friends, I was right. I used a somewhat thin rye bread, because I didn’t want this sandwich to be all about the bread. I thought the sharp taste of cheddar would complement the sweet and smokiness perfectly, but I’m sure any cheese would be absolutely wonderful. Apparently, apple and cheddar are a winning combination. You need this jam in your life. Trust me. Serve with my quick 20 Minute Tomato Soup from Scratch. Sweet, smoky, savory grilled cheese made complete with bacon jam made with apple juice, maple syrup and balsamic vinegar. In remaining bacon fat, cook the onions over medium heat until translucent. Add garlic and cook about a minute until fragrant. Add bacon back to the pot. Add remaining ingredients. Cook over medium heat, stirring occasionally, for about 30-40 minutes until thickened and syrupy (there shouldn't be a lot of liquid remaining). Optional: Puree some or all of the jam. I pureed about ½ cup in the Magic Bullet, just to give it more of a jam consistency. For the grilled cheese:Butter two slices of bread. Place one slice of bread, butter side down, into a pan preheated over medium heat. 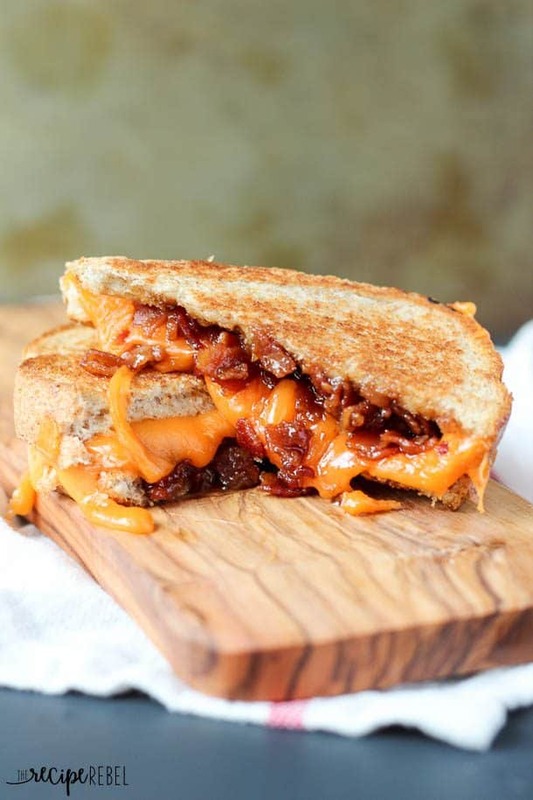 Top with cheese, bacon jam, and more cheese. Top with second slice of buttered bread, butter side up. Cook until golden brown. Flip and cook until golden brown. Cook over medium heat, stirring occasionally, for about 30-40 minutes until thickened and syrupy (there shouldn’t be a lot of liquid remaining). Optional: Puree some or all of the jam. I pureed about 1/2 cup in the Magic Bullet, just to give it more of a jam consistency. Butter two slices of bread. Place one slice of bread, butter side down, into a pan preheated over medium heat. Top with cheese, bacon jam, and more cheese. Hi. I had bacon jam at a wedding about a week a go and I’m so excited to try and ND are this. Have you tried to freeze the bacon jam before? I was hoping to make a large batch and freeze it for other days since it takes so long. I actually haven’t tried freezing it — I’d love to hear how it works if you try it! Did you puree before you cooked it down or after? Hi Ashley! Bacon jam is one of my favorite things! Down here in the South I would combine it with pimento cheese (which I make with extra sharp white cheddar cheese) for a grilled sandwich. Or just eat it with a spoon, which I also do with another Southern favorite – sorghum! We love bacon jam, too! This sounds absolutely divine and I can’t wait to try it! However, there’s one question I have to ask before I do: Do you use smoked or unsmoked bacon? Not sure if you have different kinds (I kind of think you do though, no?) but here there’s certainly lots of different kinds of bacon and I wouldn’t want to spend 45 mins on something if I possibly have the wrong ingredients on hand. Hmm, I would say definitely smoked! I’m not sure we can get unsmoked bacon here, unless what we call back bacon is unsmoked. But yes definitely go with the smoke! sounds delicious. What is the point of the coffee? Just for flavor? Wonder if I could leave it out? You could definitely leave it out, but I would substitute it with another liquid, even just water, or maybe apple juice. I think I’ve kept it for a couple weeks in the fridge. I don’t think I would keep it more than 2-3 weeks though. It is so good on grilled cheese or cheese bread though! I made it come real, I took your idea of the bacon jam with German ingredients: https://www.facebook.com/joachimscookbook?fref=nf (Scroll a little down to Doerfleischmarmelade, in the comments you’ll find the English translation of the recipe. I stuffed a chicken breast like you, but with an inlay of Italian air-dried ham and covered with tomato slices and a cheese from Austia (The recipe above, not yet translated). The chicken breast ist translated in the comments, too. I have a recipe for bacon jam tucked away somewhere but why dig for it when you have it right here with a way to use it!! Maybe that is why I never made it….wasn’t sure what to use it for! Pinned to my Man Food board because my husband and son will LOVE this.